House raise and build in under projects convert old-style, single storey timber-framed houses into new, exciting and beautiful double storey homes. We’ve provided structural engineering for quite a few house raise and build in under projects around Brisbane lately. Check out our tips and tricks for your house raise and build in under project. The house raise project normally maintains the original front wall as the new upper storey wall of the house. The lower storey wall can consist of entry structures, porticos and garages and the walls can be brick, block or timber construction. Identify a lowest timber framed house in a good area. Would raising the house increase its visual vantage? Has the house got a street presence? Would the house benefit from having more floor space? Is the existing floor plan usable? The house should pass a building and pest inspection. Does the house have a solid hardwood floor frame? Is the house free from termites and wood rot? Is the roof frame in good condition? Does the house have pressed metal ceilings? Are the decorative cornices in good condition? Are there tongue and groove walls? Does the house have 10 foot (or higher) ceilings? Double and triple gable houses get my vote for the best street appeal on a new set of legs. Don’t necessarily avoid houses with cracked stumps or uneven floors – these issues will be overcome in the construction process. Engage a building designer or architect experienced in house raise projects. Too many pitfalls will drive you crazy, add cost and delays to the project or restrict your imagination so it’s better to negotiate these issues before you start. An architect or building designer can then prepare drawings for building approval. The drawings will need to show the proposed floor plans, elevations and cross sections. I prefer drawings that show the existing stump layout, the existing bearer layout and 3D views of the finished project. Add features to the house that will add the most value. I think back decks, timber stairs, large kitchens and family rooms make house raise projects shine. A structural engineer will design and certify the new structure including footings, slabs, wall frames and floor beams. The structural engineer will need a soil test to design the footings and a copy of the building designers drawings. If you don’t already have a soil test, we recommend the soil testers on our links page. Eliminate some posts from under the house and open the space under the house up. You can remove up to 2 columns in a bearer line easily (the structural engineer will design new steel floor beams). Bearer spans tend to max out at about 7 metres because the large steel beams are hard to hide in the ceiling space. Hide new steel columns in the new downstairs walls. A clever designer will position rooms and walls to minimise the number and size of new steel floor beams to save you money. We prepare our drawings with AutoCad Lt, so if your designer can email us their drawings in electronic format, our plans will align with the designer’s/architect’s plans better because we use their plans as the base for our structural drawings. The structural engineer will check to see if you are building over underground infrastructure (we use the free Dial Before You Dig service) and will design the footings, floor beams, deck framing, roof framing and roof beams for any walls that are to be removed. The engineer may need to inspect your building to confirm which walls are carrying the roof load, but in Brisbane post-war houses, most internal walls are load bearing so expect to see some roof beams shown on the engineer’s plans. Find a builder to manage the house raise and build in under project. See here for some recommendations. 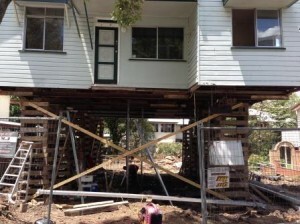 Most builders use house raise subcontractors to lift the house and install the new steel columns and steel floor beams. This is when the house floor is made level and those ugly cracked concrete stumps are demolished and removed. A private certifier or engineer will need to inspect the new bored pier footings. Click here for certifier recommendations. Most contractors lift the house, dig the bored piers and suspend the new steel columns in the bored piers before filling the piers with concrete. Once the concrete has cured and some temporary bracing is installed. The house is now self-supported on the steel columns. Concreters set up and pour the ground floor slab. Arrange an engineering inspection before the slab is poured. The builder installs the new ground floor wall framing and bracing walls. Final features typical of any new house are added are added like data cabling, wall cladding, plasterboard, new kitchens, electrical fit out and air-conditioning. Timber floors are polished and bathrooms and refurbished. A beautiful new double storey house is ready to house and protect its owners with a fresh, but essentially original, new facade. 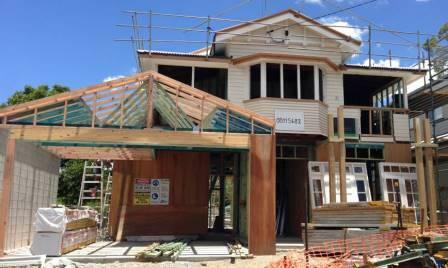 I love what our clients are doing to the beautiful houses of Brisbane. Our website and FaceBook sites have a host of recent house raise and renovation photos. Have a look and let me know if you still have any questions about the house raise and build in under process. Previous PostALS Icebucket ChallengeNext PostR U OK?